Suikun Rilla had no threats. Suikun Rilla met the expections in Vincennes on Sunday. After a few question marks after Thursday’s race, he left nothing to question on Sunday. 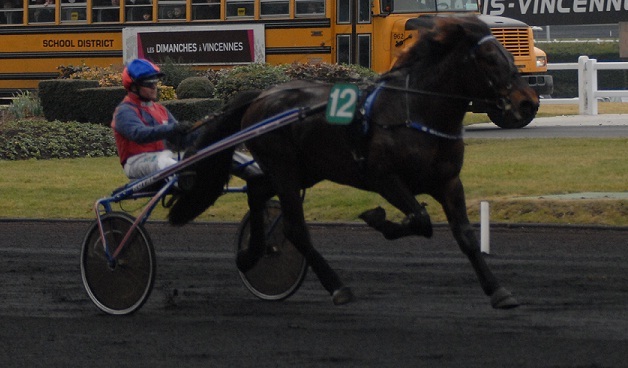 The French driver Franck Nivard drove Suikun Rilla just as Harri Sulku had told him to, and his tactics brought the 10 000 euro prize to Finland -along with the satisfaction of leaving behind very good foreign horses. Sulku told he had known that Suikun Rilla would win. – I was just trying to keep it in secret, he told happy. Suikun Rilla made a new personal record 1.23,4a. He is at his best when he trots barefoot. – I am speechless in front of this audience, told Sulku feeling emotional. This was a dream come true for the whole family. This win means so much to me. I have always dreamt of driving in Vincennes. Suikun Rilla’s nickname is Elvis and as we saw, he can arrange quite a show! The trip was both vacation and celebration in itself. It is a great race and a good way to network with other horse people. Sulku’s wife and daughter where also present celebrating Suikun Rilla. The French hospitality made an impression on the Finns. After a long way back home the stallion gets to rest, and then start his preparing for finnhorse trotting championships at Mikkeli in July. The youngest member of the Finnish team, Juho Hietanen, kept the flag up high. Feelis ja Provinssi at the parade. Their celebration was left yet to be seen. Categories: Harness racing | Tags: Equestrian, Finland, finnhorse, harness racing, horse, raviurheilu, suomenhevonen | Permalink.